Dog boarding and training facility located between Peterson and Lanesboro. Fitness facility with 2 floors of cardio, circuit training and weights. Masage therapy, infrared saunas, tanning beds. Daily or weekly packages. AcenTek serves many communities in Minnesota, Iowa, and Michigan. It now offers internet and video/t.v. services for residential use as well as IT consulting and managed, hosted services for businesses. 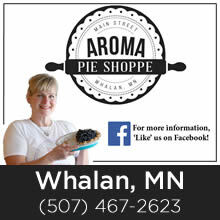 Year-round - Books, specialty foods, Willow Tree, jewelry, clothing. Bike and Camping items. Amish crafts, produce, baked goods & more! May-October. Outside of New Generations of Harmony Antique Mall. 50 Industrial Blvd NE. Enjoy flocks of colorful backyard birds up close on this former rustic farm! Also discover numerous bird feeders and birdhouses along with custom seed blends, birding expertise and more! Antiques and Boutique. We offer something for everyone. Unique clothing for women and children and don't forget the antiques for the collectors. Inventory constantly changing. ELCA church located on the hill overlooking Lanesboro. Sunday worship is at 9am. Refreshments and faith formation follow. a unique boutique featuring jewelry, handcrafted items, essential oils, purses, made in the USA boutique clothing and more! Featuring five rooms full of unique antiques and collectables. Call for appointment or seasonal hours. Our quaint gift store offers a unique variety of area products, handcrafted items and seasonal apparel, accessories and jewelry. Come and see Cheryl's beautiful quilts on display, with many of them for sale. Fabric, thread and notions available. Sewing classes and quilting retreats also available. By appointment, visit the art gallery and museum of Michael Sieve. Our small town atmosphere is perfect for a pleasant and relaxing visit. An Amish-owned furniture store just northeast of Harmony, offering a wide variety of Amish furniture and other goods. Country crafts abound in a farm shed full of treasures for gifts or to keep for yourself. Visit Facebook for select days and hours. Touchless automatic and manual brush/spray self-serve bays. Credit or debit card friendly. Friendly people offering salon services for everyone! Dedicated to preaching the Gospel and equipping believers for their purpose to be witnesses of Jesus to the world. An active congregation serving people of Lanesboro and surrounding communities. Services Sunday mornings at 10:30am and second Sunday of the month at 5pm. Antiques, collectibles and vintage finds located on Main Street. Fine furniture gallery. Our professional staff and complimentary interior design service will help you find solutions for that special area or hard to find item. Our friendly staff, professional delivery team, and great customer service are just a few more of the reasons to visit. Gentle and affordable pet grooming. Appointment lengths may be based on your pet's personality and comfort. Affordable trendy fashions for all ages. Come in and see our wide variety of kids and adult fashions and gifts. A welcoming church in rural Lanesboro surround by the fields and hills of southeastern MN. A re-use store with gently used clothing, household goods, home decor, kitchenware and more! Locally owned bank offering 24-Hour Walk-Up ATM services. The Fillmore County Airport provides a convenient and valuable transportation link for the local communities by allowing businesses and individuals to use general aviation instead of dealing with the airline hub system. Called together in baptism, nourished at the Table in holy communion, and sent into the world, we trust in God's love for all creation. Serving the Harmony Community for 125 years- 24 hour ATM available. We have been providing the finest in personalized banking service to southeastern Minnesota since 1901, and are recognized as being a leader in community banking. Trusted locally owned and operated building materials, supplies and other related products and services provider since 1983. We offer a complete line of quality lumber and building materials for contractors and homeowners. Carpentry and granicrete counter tops. Hometown local grocery store with a deli. Full service floral and gift shop, featuring seasonal produce May-October. Seasonal roadside produce stand July-November. Locally grown fresh produce! 625 Main Ave N.
A SELCO library with free wifi- campers welcome! Quality Amish-made rugs, located at 33343 Garden Road outside of Harmony. Small-scale sustainable family farm offering you a healthier way of life by providing all natural, healthy meat and produce in an ecologically responsible environment. Organic meat and chicken. Tack Shop: Carry a full line of English and Western tack and horse care products. We also carry clothing, jewelry and many gift items. Equine Reproduction Center: Complete breeding facility for all breeds of horses. Open five days a week to accommodate your schedule. Proud to serve the residents of Houston and the surrounding communities. Off sale liquor and beer. We provide Sales on Site and On the Farm Service. We service what we sell! Dixen Lawn Mowers. Hardware, housewares, gifts, plumbing, HVAC, small and large appliances- Kingsley Mercantile has it all! Top Tier Gasoline and Diesel, hot and cold food and beverages, no-fee ATM, groceries, copy machine/fax service, and more. Gas, air, groceries, convience food, convinience store, friendly people! A salon and spa located on site at Harvest Farm Campground. 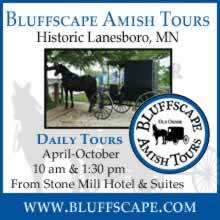 Your information source for the Lanesboro area. 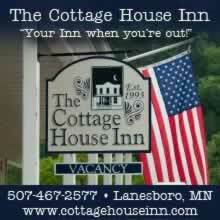 Find a place to stay, menus, maps & event announcements. Your small town convenience store with quality gas, groceris, snacks, DNR licenses. 24-hour pay at the pump available. Self-serve two bay car wash, and a laundromat with 8-20 lb washers and dryers and one 35 lb washer and dryer. Open 6am-10pm. Change machine available. Year-round - Business conferences, reunions, weddings, dances. Capacity: 400 people. 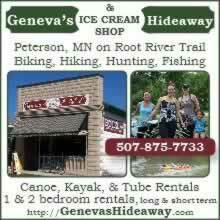 Seasonal - Bikes, recumbents, canoes, kayaks, tubes, rentals, sales and repairs. RV and camping supplies; bait. Amish owned furniture store specializing in quarter sawn white oak. Full-service bank with an experienced and friendly staff. Member FDIC and Equal Housing Lender. Merchants Bank offers an ATM in their vesitbule. Family farm with on-site creamery producing squeaky cheese curds, Artisan-block cheeses, cheese spreads, and locally made honey. 24-hour access to a fitness center to help you lose weight, gain strength, keep active! Call us for daily, weekly, monthly plans. 10,000 square feet of antiques, collectables and vintage-ware! Offering high quality brats, sausages, beef, pork, chicken, snack sticks, bacon & much more. Quality branded fuel and 91 non-oxy premium gasoline, hot or cold food, many grocery items and more! Fishing and hunting licenses. 24-hour laundromat equipped with Maytag washers and dryers, including extra-large units for bedding and large items. Beer, wine, liquor and malt beverages, Mon.-Sat. 10 a.m.-10 p.m. and Sun. 11 a.m.-6 p.m. The mission of the Preston Public Library is to provide and promote open access to reading, cultural, intellectual and informational resources that will enrich, serve and enlighten our communities. Providing various Heating, Plumbing and Air Conditioner Installs and Service for Residential, Agricultural and Commercial. Amish furniture store featuring a large inventory including dinning room sets, bedroom collections, living room furniture, wide screen  plasma and LED TV stands, kitchen islands, jewelry armoires, desks, toys and poly lawn furiture. Hand-crafted baskets are functional as well as beautiful. Each basket's stone was found on the banks of the Root River. By appointment. A Christian and Missionary Alliance Church: Loving God - Sharing Jesus - Caring for People. Sunday service at 10am. Locally owned, full service florist. Everyday occasions, special events, weddings, funerals and so much more. Delivery available. Recovery Coaching and Wellness Practitioner. Working with addiction and creating healing workshops and programs. 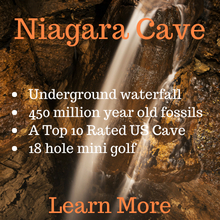 Full service trout fishing shop including gear, guides and lodging. Seasonal pool with zero-depth entry, children's pool, and larger pool with diving board. Daily fee or seasonal pass. For 20+ years, Dr. David Hinz has provided safe, effective, and natural health care treatment. Dr. Gary Marcoux and staff provide complete family dentistry, as well as urgency/emergency treatment. Complete hardware needs, equipment rentals, outdoor sporting goods, pet food, fishing and hunting licenses, seasonal garden center. Learn about God's love for you, grow in faith, and share your joys and sorrows in a community of care, compassion and faith. Vendors sell locally grown or produced foods and handmade wares, June through mid-October, Wednesdays 4-6:30 pm at the Rushford Depot . Public library with Wi-Fi, computers, DVDs, audio books, and thousands of books. A community bank since 1867, local decisions mean prompt service and flexibility to tailor products to meet your financial needs. By appointment, shop handmade pottery. Raising independent publishing to the level of indie music and film. Buy print copies of Shipwreckt imprints in-store or online. Year Round - Rental available for groups and family gatherings; Full kitchen. Capacity: 100 or 60 at tables. Call for rates. The Hart country church with the love of Jesus. 9:00 a.m. Sunday School and 10:15 a.m. Worship. Lutheran Church, Missouri Synod. Worship Service Sunday mornings at 8:30 and Sunday School at 9:30 a.m.
Pharmacy for your medication and personal care needs; unique gifts for any special occasion; specialty foods; clothing & more. Visit the Stone Mill Hotel & Suites gift shop to discover unique clothing, jewelry, Baggallini, Amish baskets, cards, and home decor. Decorative, wearable, and functional art. Antique and vintage items in our five room store. A little something for everyone! The Thrifty Threads Store sells gently used items such as quality clothing, toys, and more! The store also sells hand-crafted greeting cards, beautiful quality rag rugs, and hand-crafted jewelry. Built on service you can trust. Providing professional year-round yard services. An artisan boutique featuring unique, handcrafted items. Many one-of-a-kind items made just for cyclists. An Amish-owned furniture store specializing in dining room set, with smaller toys and other items. By appointment, providing quality handmade writing instruments and other unique turned wood and wooden gift items . Serving Original Equipment Manufacturers Since 1986. We’ve been supplying high-quality products direct to manufacturers for more than 30 years. Visit Tom Taggart DVM and his staff for all your large and small animal care needs. Animal care supplies also available. Located in the Village Green, this gift shop is housed in Harmony's historic train depot! Offering the largest selection of Amish-made quilts in MN! Health care for the area since 1959; services include check-ups, screenings, immunizations, and care for injuries and illness. Stop into Preston June 8th, July 13th, August 10th, September 7th and October 12th for the Preston Pop-Up Markets! Located on Fillmore Street in downtown Preston. Vendors sell locally grown or produced foods and handmade wares!